Five men from Central Wesleyan, Cambridge Road, Hastings and eleven from Calvert Memorial, Mount Pleasant Road, Hastings are listed here. Pte. Frank Couchman 9th Bn. Middlesex Regt. Pte Arthur Lloyd 1101 2nd Bn. Royal Sussex Regt. 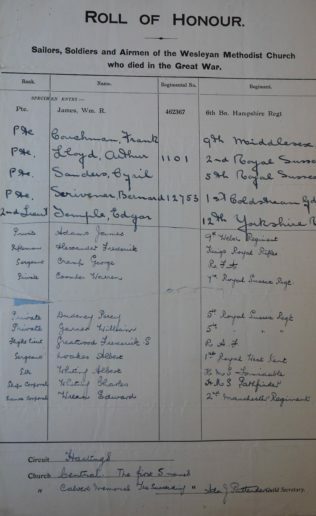 Pte Cyril Sanders 5th Bn. Royal Sussex Regt. 2nd Lieut. Edgar Temple 12th Bn. Yorkshire Regt. 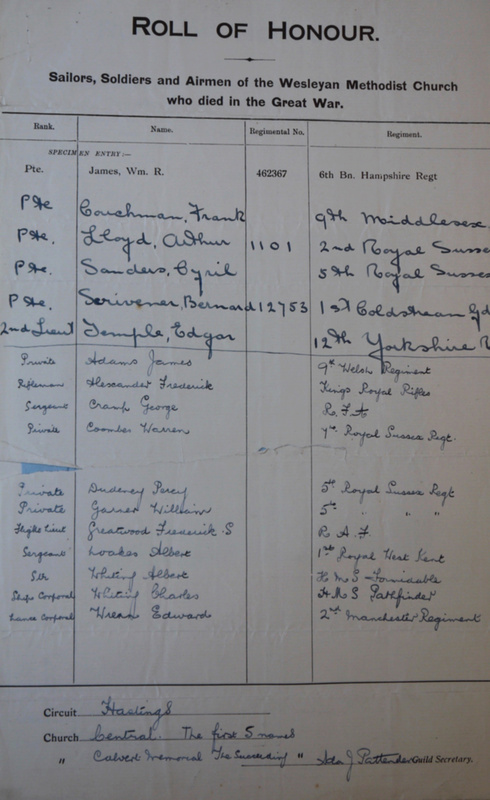 Private James Adams 9th Bn. Welch Regt. Private Warren Coombes 7th Bn. Royal Sussex Regt. Private Percy Dudeney 5th Bn. Royal Sussex Regt. Private William Garner 5th Bn. Royal Sussex Regt. Sergeant Albert Woakes 1st Bn. Royal West Kent Regt. Lance Corporal Edward Wrenn 2nd Bn. Manchester Regt.